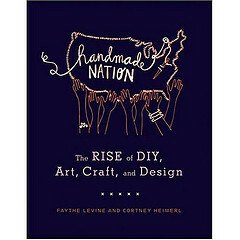 Handmade Nation documents a movement of artists, crafters and designers that recognize the marriage between historical techniques, punk and DIY (do it yourself) ethos while being influenced by traditional handiwork, modern aesthetics, politics, feminism and art. Fueled by the common thread of creating, Handmade Nation explores a burgeoning art community that is based on creativity, determination and networking. In 2006 first-time director Faythe Levine traveled to 15 cities, interviewing 80 individuals. Levine captured the virtually tight-knit community that exists through websites, blogs and online stores and connects to the greater public through independent boutiques, galleries and craft fairs. Interviews were also conducted in artist studios and homes of the featured makers. A companion book is available (image at top of this post). You can also visit the film’s Facebook page. and kelly, that whole indie movement can be the art snobs at times, too. like when i was around the poetry scene in boston, etc, for years and years and i wasn’t slam enough for their tastes, or generally highly politicized, either, yet, what i did was respected by some of the older poets around the scene, because it was – poetry. what you do is beautiful and it’s jewelry whether it fits a particular funky niche or not! that’s the funny thing about being independent or an independent movement of any kind. on some level, some aspect reaches a wider market and as it becomes recognized as a genre, is exactly when it starts being less independent…catch-22. i think you nailed it, cathy. the indie market has a funky feel to it. my work is not funky. and that’s okay with me. Funky is only a lifestyle to few, and remember what is funky changes with the wind. Sometimes I want beauty, delicacy, sometimes I want bold and edgy. Depends on the day. Depends on the item in question. So everyone keep on keepin’ on to the tune of your own inner muse! Be true to yourself and somewhere, someone is appreciating it. I appreciate all of your observations about the need for each one of us to be who we are and do what we do . . . . and someone will appreciate it! Since I”m kind of traditional and even a bit “old-fashioned” in my approach to creativity and design, I thought for a long time that no one would be interested in my work if I wasn’t edgy, techno, funky, or whatever all of that stuff is. And I would cruise around the indie sites and feel like I had missed out on the “artist gene,” and that my poor efforts at creativity were just so boring. Until I started getting emails from lots of other women wanting to learn how to do some of the stuff that I do! That’s when I started writing my eBook patterns, and I realized that there are lots of “old-fashioned” folks out there who love my style. It’s a big, big world out there, and there’s a place for all of our gifts. Let’s just keep on giving our heart and soul to our own art, and the world will be a better place! I think your comments are all important. For me, what’s most interesting about things that are “funky” is their authenticity. I think that creating something that is honest and speaks to who you are is so much more valuable than trying to capture an abstract idea of “edgy” (or the dreaded “marketable”). Dig deep and let it fly. Success — whatever that means to you personally — will surely follow, in one form or another. “or the dreaded “marketable”‘….i hear ya sister! i was reading through a forum thread on etsy last night and the op asked the question ‘have you found your niche?’. i was saddened to read that so many responders considered their ‘niche’ not necessarily what they truly loved to do but rather what would sell well on etsy. i know my jewerly does not sell well on etsy, and that’s fine with me. apparently, etsy is not my ‘niche’. Yeah, Kelly! Sometimes so challenging to stay “true” to what you’re doing…but you really have a vision, and I applaud you for knowing yourself. This has been a great conversation! I also struggled with the tug-of-war between doing what I do because I love what I do, and wondering if it would sell. Thanks so much to all of you for the encouragemt to be true to my own vision and trust my heart to lead me where I need to be, not necessarily where “the market” might require. Wow… i checked out the link to this movie and it looks fascinating. I am not sure how things work with the screenings and such… is this going to be released on dvd so those of us who would be unable to make a screening (i’m in korea) would be able to watch it somehow? Dale, it looks to me like there are only live screenings right now — but there is definitely an international audience, so keep your eye out for Korea! And maybe e-mail the filmmaker for DVD plans?